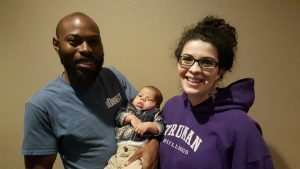 D’ Markus Thomas-Brown and wife Gabrianna are leading a plant in Columbia, Missouri which is his hometown. There is a tremendous back story about God’s Sovereign hand working through his mother Tami years ago. She sent D’Markus to Kirksville to help save him and now he has returned to Columbia to advance the Kingdom of God. Here is an interview with his mom about the story highlighting the goodness of God. He was delivered from the streets and now he has returned to help others find new life and freedom in Christ. 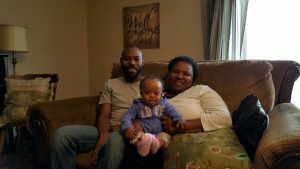 In October of 2001, D’Markus’ mother, Tami sent D’Markus to Kirksville to live with his father because of further developing struggles she was having keeping him from trouble and harm’s way. She proclaimed that she would rather lose her son to God than to the streets of Columbia. The following is an interview with both Tami and D’Markus regarding what took place 16 years ago. Tami: He was always in trouble, rebellious, didn’t like to sit still, now they call it what… ADHD [attention deficit hyperactive disorder]? (laughing after comment). As the years went on he decided he wanted to be a follower, stayed with the crowd that made bad grades and got in trouble. When you were raising D’Markus did you feel that you had a good relationship with God? With D’Markus? Tami: No, I sent him to church and vacation bible school. One day he came back and said he was never going back because the people were hypocrites, gossiping about one another and he didn’t think it was God. At that point, I really lost him. He learned how to use a gun and that was the scariest thing that happened. It was hard trying to keep him on the track. What happened that made you decide to send D’Markus out of Columbia? And why to Kirksville? Tami: I always told him growing up I’d rather lose you to God than the streets. I tried everything. A plus programs, you name it. Billy called at a time when he had me at my worst and told me I’d done my part and wanted me to send him up there so he could be a father to him. I felt that he was my baby and I needed to raise him. I tried so many things. I didn’t know what was going on with D’Markus, it seemed like he was going deeper and deeper into depression. And Billy called again and encouraged me to send him up the highway (she’s crying at this point). I agreed when I came home one day and he had a girl in his room in my house. I told D’Markus [that he was going to Kirksville] and he showed no emotion, but I knew it caused him pain. I picked him up every weekend until he got used to it. How did you feel about sending D’Markus to Kirksville? Tami: He had a hard time adjusting to the new family in Kirksville. There were many struggles fitting into Billy and Dee’s already established family. I constantly had to talk to him and encourage him through tough situations. Eventually, he would start spending time with and talking about different families there: Joni and Mel Hoffman, Sherry and Larry Smoyer, Kathy and Dave Krueger, and Paul and Dorthea Shipman. They showed him so much love! When I was able to go to the church in Kirksville, I found them and told them that they were the ones who taught D’Markus about love and how to love. Being in Kirksville there were good and bad sides, but the goodness outweighed the bad. An incident happened at home once, 6 months before he was going to be done with school, and I was so upset that I drove up to Kirksville ready to bring him home. We were at the point of fighting but managed to resolve the issues. In spite of all this, he found God, and that was what I wanted. He graduated and went to Tucson, AZ, and then came back to Columbia. I didn’t know it but he had gone back to his old ways. Eventually one day he sat down and just said: “I’m done.” I realized that God was with him the whole time, through drinking and driving and all sorts of things. And once he made that decision for God he has been with Him ever since. What did you expect to come out of it? How does that match up with what actually ended up happening as a result of D’Markus moving to Kirksville? Tami: He did a complete 180 degree turnaround. Looking back, do you think that it was God’s plan all along? Did you believe that at the time you sent D’Markus off? Tami: Yeah, I can definitely see that it was God’s hand. What’s your relationship with God like now? And with D’Markus? Tami: My relationship with D’Markus didn’t change, I never lost him, and we’ve had disagreements, but we’ve always picked up and moved on. I believed in God before, I knew He watched over us and all, but as far as a relationship there wasn’t one. Now I am growing in a relationship with Him. What effect has D’Markus and Gabrianna moving back to Columbia had on your life? Tami: Totally positive. They brought people into my life, like you guys (the Church). I just feel that when I’m around you guys I can be me. When I go back to my life it’s like going back to where I started. Tami’s final thoughts: I was very afraid when I sent him [to Kirksville]. My family was upset with me, and it was rough but we made it through. D’Markus: I thought it was fine. For a lot of my friends, it was normal for the dad not to be around. It’s interesting that a mother would say it was because I was being a follower is the reason I was in trouble because you don’t want to think your child is making bad decisions out of their own desire. But that’s what I wanted to do. What was your relationship with God like? D’Markus: It was tradition. You respected that church was on Sundays but you didn’t go, you just lived your life. I went to VBS [vacation bible school] at a Baptist church in town and saw that that’s what it was like for other people too. They’d do church on Sundays and then gossip about each other the rest of the time. I thought that if that was what it [church] was all about, I didn’t want any part in it. Did you have any inclination to leave Columbia before your mom [Tami] told you that you were leaving? D’Markus: No, it’s funny, I had plans for homecoming with my cousin on the night my dad showed up to pick me up, I thank God now that I didn’t get into what I had planned. How did you react to the news that you were being sent to Kirksville? D’Markus: I just accepted it in the moment, I contemplated running away but it didn’t happen. What did you think would come out of it? How long did you expect to stay? How does that match up with what actually ended up happening? D’Markus: I thought she would eventually cool off and let me come back in a couple of months. I didn’t plan on Christ meeting me in my situation and me giving my life over to Him in the process. Looking back, do you think that it was God’s plan all along? Did you believe that at the time you left? D’Markus: I wasn’t sure what to expect when I got there. I tried to keep my friends in Columbia, but that didn’t work out. I knew I had to be there because I had nowhere else to go. I planned to come back to Columbia, but it never worked out. I most definitely see God’s hand through the whole thing. Even going through learning how to live with my dad and Dee. It was a rough time, but it drew me closer to the people of God, staying with people outside of just my family. I was able to meet God and become part of His church. What’s your relationship with God like now? And with your mom? D’Markus: When I left Columbia, I wasn’t saved. When I got there [Kirksville] I got saved, and that’s where my relationship with Christ started. Why did you and Gabrianna move back to Columbia? D’Markus: We felt God told us to move. God told us that there were people who were like us that He was going to use us to reach. Such an amazing testimony of God’s sovereign hand. Thank you for sharing! Love you guys!